5 STAR LUXURY on the Cairns Esplanade . . . Spacious, modern Vision Cairns Holiday Apartments 2 & 3 bedroom apartments and penthouses feature quality amenities and facilities. 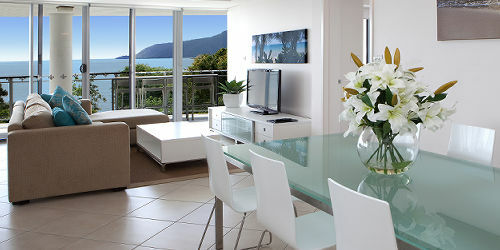 This Cairns accommodation property is rated as one of the best values on the Cairns Esplanade. In a prime location, these Cairns apartments are situated just 100 metres from restaurants, shops and entertainment. 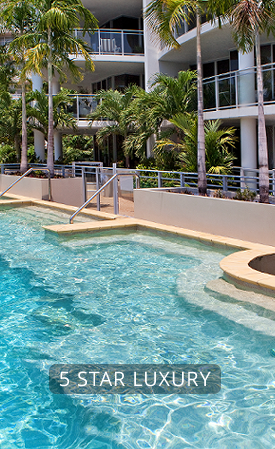 The Cairns Esplanade is on your doorstep with all its free activities and only a short stroll to the NEW Cairns Aquarium & Aqua Luna Restaurant, the stunning Cairns Esplanade Swimming Lagoon and the Reef Fleet Terminal. 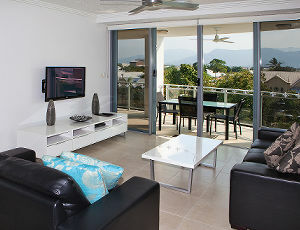 Besides one of the best values on the Cairns Esplanade,Vision Cairns Holiday Apartments has one of the best rated locations in Cairns also. Because of this property's central location to the Great Barrier Reef, the Rainforest and so much more, you will be spoilt for choice selecting from the many tours, attractions and activities Cairns and Tropical North Queensland offers. A perfect tropical getaway for families, couples and friends. A convenient location for the business traveller.